Our stylists work with you to craft a signature style. Includes a shampoo, conditioner with relaxing head massage, clean rinse, cut and style. Finished off with a refreshing hot facial towel. A classic straight razor shave. Begin with two steaming facial towels to soften the beard and open your pores. We apply warm pre-shave oil, continue with a full lathering and complete an initial shave along the grain of your beard. After re-lathering, we shave against your beard grain, if preferred. We finish with a cool facial towel and aftershave application. Take your shave to the next level. Our Executive Shave offers everything included in our Classic Shave, plus a post-shave warm towel cleansing and Deep Detox clay mask application. We allow the mask to dry for 3-8 minutes, depending on skin type and then remove it with a clean, warm towel. We finish with a cool facial towel and aftershave application. Who said your face should have all the fun? We move our steaming towels, pre-shave warm oil application, full lathering and straight razor shave from your face to your head to give you the sleek, smooth silhouette you love. Get rid of unwanted grays without looking unnatural. We use a combination of your hair’s original colors and tones to provide coverage and naturally blend away grays. The well-groomed man’s solution to the unibrow. Our careful brow waxing uses warm wax and cloth strips to separate a single brow into two. Bring your beard back to glory. Our beard trim and shape helps tame wild whiskers, muscle moustaches back into shape and brings definition to shaggy shaves. Our same stylish men’s haircuts scaled down for smaller patrons. Available for boys ages 5-12. Look sharp by keeping your neck trim and tidy between your haircuts at GENT! This service is free when done within three weeks of your last haircut with us. Want to skip that neck trim between cuts and keep your neck clean for 3 weeks? This quick 10 minute service is the perfect way to avoid an unsightly neckline between your haircuts! Gives us 5 minutes and we will get ride of those objectionable ear or nose hairs with a quick wax. It last longer than trimming them and your significant other will have a deeper affection for you. Want to look like you got 9 hours of sleep, a morning workout, and just finished a kale salad? Try our 15 minute express facial. We will rid you of dead skin, add some necessary moisture and give you a relaxing experience in the process. A revitalizing facial formulated specifically for men. We analyze your skin and then use a customized men's facial line to cleanse, exfoliate, hydrate and tone. This service takes it up a notch by including hot towel treatments and a relaxing face massage! A groom’s party at GENT offers a relaxed atmosphere in preparation for the big event. 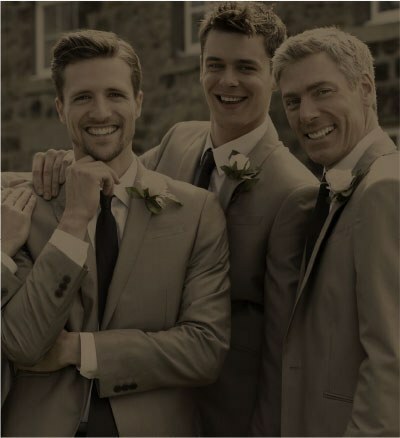 Treat the men in your wedding party - from ushers to ring bearers, musicians to groomsmen, her dad to your dad – to a unique and truly memorable classic barbershop experience at GENT Cuts and Grooming. Your wedding party gets the run of the shop at our conveniently located Minneapolis location. You pick the services, you pick the music, you pick the TV channels – we just help you and your guys look great for the wedding. Call us about scheduling a groom’s party and be sure to ask about customized product packages for use as groomsmen’s gifts!